It’s now December and we’re coming to the end of 2016. Seems quite funny to type that. As they say, where have the last 12 months gone? So let’s wrap up this year. 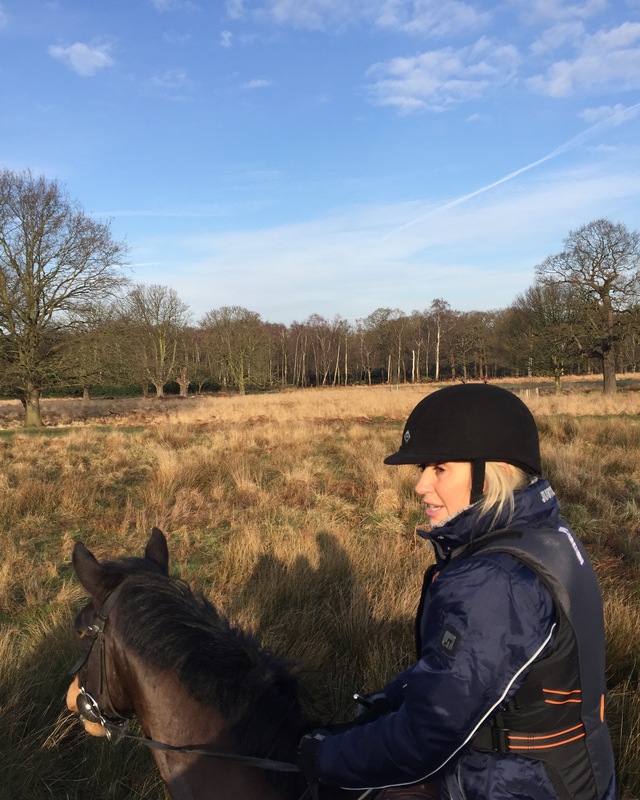 You probably know by now I love anything equestrian and The Spanish Riding School of Vienna were back in Blighty, performing at Wembley and also the Barclaycard Arena in Birmingham. The SRS are the oldest riding school in the world, and to be hosting this event was quite incredible. Thank you to all who came along. As a regular contributor on Sky News reviewing the papers, it was a first for me in the new ‘glass box’ on Sunrise. Very space age and hi-tech. I don’t think you could get any further removed from my usual position, standing in a field talking property! 2016 has certainly been a year for news stories…. My filming schedule is now nearly over for this year with Escape to the Country, The Escape Revisit Shows and Wanted Down Under put to bed with transmission dates looming. Wanted Down Under will now go out at the beginning of January 2017 on BBC1 and is a bumper series with more episodes and revisits than ever. One of the most powerful and impressive projects I’ve been involved with is called People Power. The documentary, which we filmed in Bristol with Dave Myers (Hairy Biker legend), Mark Millar, Juliet Sargeant and Martyn Ashton, should transmit on BBC1 the week of 12th December and was a truly brilliant and eye opening experience. Try and watch it if you can, or if you miss it take a look on iplayer. It shows the power of volunteering and the differences it can make to peoples and communities lives. Both ends. Having always done charity work but never volunteered, not only was it a lesson on giving back or giving someone a leg up, it also spurned me on to become a volunteer near where I live. I’m not going to preach as it’s a very personal thing to do, but it’s certainly changed me and how I look at certain situations. Working with such devoted and tireless volunteers, from all walks of life and all ages, showed me how powerful people and communities can be. A true lesson. Lets finish with a glam shoot! 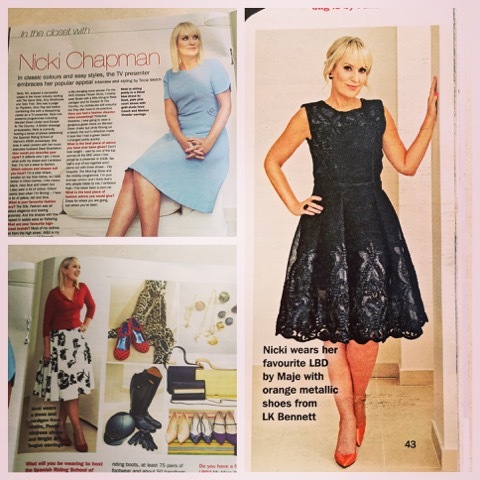 Thank you to the superb Sunday Express Magazine team for my ‘In The Closet’ feature. 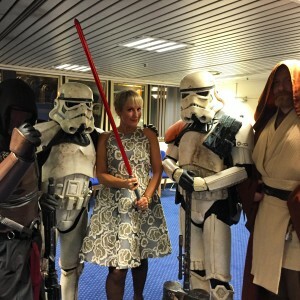 Loved every minute of it…. wish I looked like this every day….!!! Time now to sign off. Whatever you’re doing, I hope you have a smashing Christmas and I’m going to wish you health and happiness in 2017. What will your new year’s resolution be? Mine… patience, tolerance and kindness. And also to enjoy turning 50 in January. Gulp. Yes, it’s time for an update and I hope you’ve all had a good Summer! So, here we are in October, and already my mind is wandering towards Christmas… Too soon?? Ok. I’ll hold that thought and update you on the last few months. Now here’s a name drop. 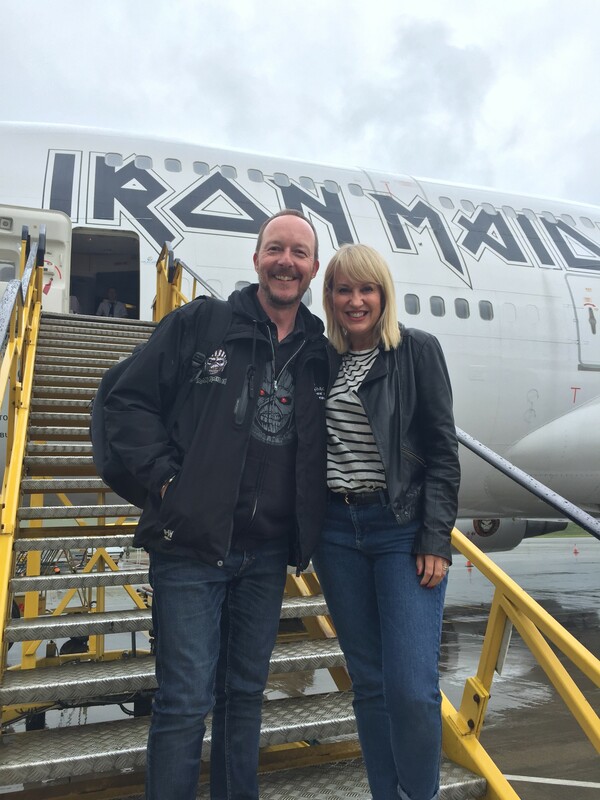 My husband co-manages Iron Maiden with the legendary Rod Smallwood and Andy Taylor (awesome guys) so his daily commute to work has been on this beauty for the past 6 months or so whilst they’re on their world tour. 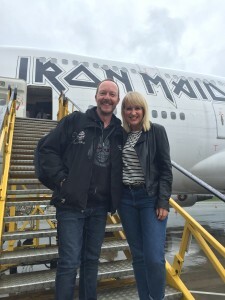 The band and management kindly allowed me to bag a lift to Oslo in Norway to join them. Saw the band play in China back in April but sadly couldn’t quite get a seat on the plane… but this time. Oh yes! Last time I went on a private plane was when I day to day managed the Spice Girls World Tour for Simon Fuller, but our plane was nothing like this work of art. And what’s more, the lead singer flies it. Double oh yes. It’s times like this that I love my job. Or should that be my husband’s ‘job’. I might add my first visit to Oslo didn’t disappoint, but I was too excited about the mode of transport. Look out for Jules Hudson and my ‘Celebrity Antiques Road Trip’ appearance with the fabulous Natasha Rankin and Philip Serrell who held our hands, talked us through our antiques, helped me find 1st gear in the old Morgan and showed us a whole new world. 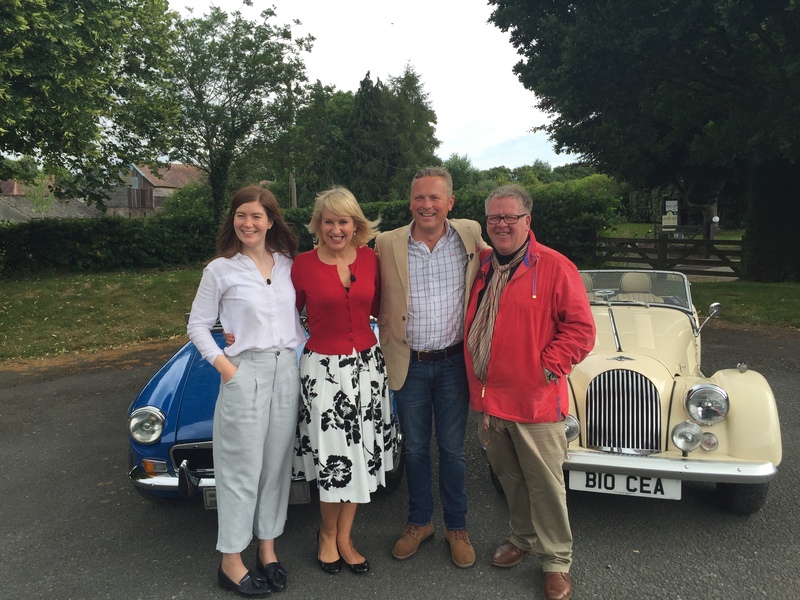 It goes out shortly on BBC1 and I don’t want to say too much apart from if you love this series it will certainly be a show to remember… Apologies to the drivers of Herefordshire who had to pass me on narrow lanes when I stalled a few times. And as for finding reverse, forget it. Where’s my Evoque…? . Managed a few days with friends in the South of France and then Portugal. Both divine trips away which were over too soon.. Who doesn’t love a Summer escape? Shacky and I by the pool. Thanks for the wonderful day out with the North East Ladies (NELD) who organised a fabulous lunch and welcomed me to their fold. All 600 hundred of them. Empowering to see so many women in one room and hearing some moving and incredibly personal stories. Also to the North Yorkshire West Fed WI girls in Bedale at the end of September for educating me in all things ‘WI’. These ladies are certainly inspirational and never seem to stop let alone have time to bake cakes as some people may presume… although I’m sure they do a mean fondant fancy. September and now October has seen me visit 9 counties in 9 days… From London, Wiltshire, Somerst to County Durham, Nottinghamshire, Derbyshire then back to London then off to North Yorkshire and on to the towns or city gardens of Poundbury, Letchworth, Milton Keynes, Ebbsfleet finishing in my home town of Herne Bay. Phew. Why? Filming some exciting new programmes called ‘I Escaped to the Country’ or ETTC Revisits (yes, people who have bought our houses over the past few years) as well as a new series for the BBC on housing which has been fascinating. More on that later, and I will let you know when they are due to air. 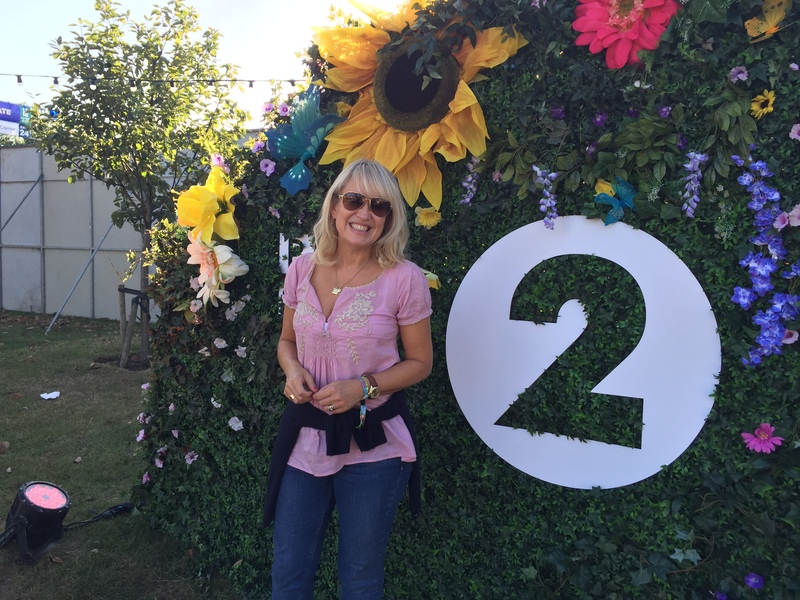 You may have heard my dulcet tones on BBC Radio 2 quite a lot over the Summer and now into Autumn. I’ve been dep’ing for the hardest working woman in radio, Vanessa Feltz, as she sits in for Jermey Vine. Not many things drag me out of bed at 3.30 am on a daily basis, but the Early Breakfast Show is one of them! It’s been an absolute joy and hope to do more over the coming months. Many of you have been texting and tweeting in regularly, thank you. I appreciate all your comments, feed back and hilarious stories. Makes me feel like part of the family. Making my way to Bristol later for filming so look out for me around the city all this week. 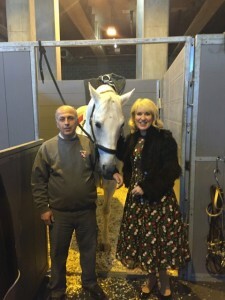 I’m also hosting the Spanish Riding School of Vienna in November at Wembley and also the Barclaycard Arena in Birmingham, so if you love your dancing horses (and want to watch the oldest riding school in the world and also the most elegant display their expertise) do pop along. It’s truly spectatular and I’m delighted to be a very, very small part of it. Finally, well done to Team GB and Paralympic GB this year at Rio. 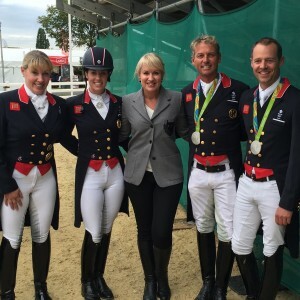 Let me leave you with a photo of yours truly with Charlotte Dujardin, Spencer Wilton, Fiona Bigwood and Carl Hester who won Silver in the Team Dressage this year at the Olympics and of course, Charlotte won gold too. Our heroes. It’s now time to sign off. I know blogs are meant to be short but I haven’t written in months! So it’s early June, the weather has improved again thank goodness, and I’m sitting in my hotel room in Norfolk looking out over the most beautiful woodland. 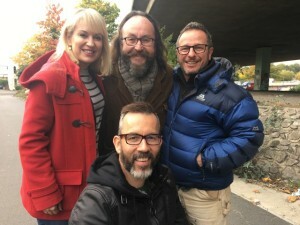 I’m on location for Escape to the Country and when the weather, county and houses all work in unison, it has to be one of the best jobs in television. Spring into Summer is always a busy time for me in a good way, with the month of May being dominated by the RHS Chelsea Flower Show. And what an event it was. I always talk of the RHS Chelsea Flower Show being the highlight of my presenting calendar and this year certainly didn’t disappoint. 11 acres which have been transformed within just 3 weeks into horticultural excellence with a few glasses of bubbles and pimms consumed along the way. Glorious. For those who either haven’t visited the show, or missed the coverage on television, let me explain. 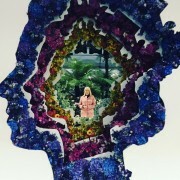 Take the catwalk of the fashion world, and then replace it with 17 Show Gardens, 7 Fresh (contemporary/cutting edge) Garden Designs and 6 Artisan Gardens, a Great Pavilion packed full of floral displays from nurseries around the world as well as glorious floral art plus the Floral Design Studio. And that’s my office for the whole week. Lucky me. 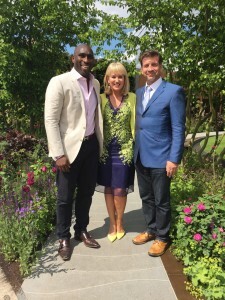 This year my guests included Kate Adie, Meera Syal, Brendon Cole (still no invitation to appear on Strictly sadly), floral king Simon Lycett, Noah Huntley, Kelly Brook, Monica Galetti, Alex Polizzi and Sol Campbell. An eclectic mix all linked by their love of gardens and horticulture. 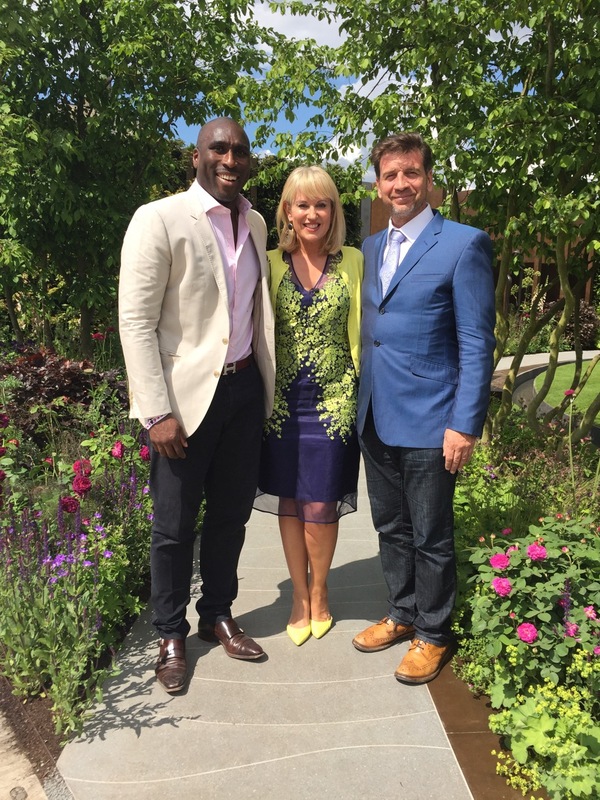 Just before the show, all the presenters were asked to arrange a floral container, or pot, which would be included on the RHS Feature Garden, designed by the super talented Anne-Marie Powell, as part of the Greening Grey Britain campaign. Imagine my delight when I spotted my floral container taking pride of place right at the front of her garden. ‘Oh Anne-Marie, I’m thrilled you love my pot enough to have it right at the front’ I trilled… ‘Yes’ she replied, ‘I needed something to stop people stepping into the water feature…’ I think that elusive gold medal is still some way off for me. 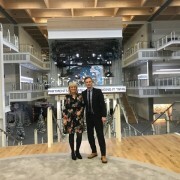 It’s a huge team effort with hours and indeed pages of coverage and by the Saturday, I’m always disappointed that the show is over for another year. Here are a few snaps taken behind the scenes with guests and presenters. Until next May I’ll just have to make do with my own small garden escape …. Take care and thanks for all your messages on twitter, instagram and on this site too..
Spring has sprung and I think the weekend was the warmest so far this year! How are we all? Last time I wrote, I’d just started my 6 weeks of Lent which I’m pleased to say is now well and truly over. No bread, no alcohol, no sweets, no chocolate. Boy, was I fun during that time… although I must admit, half through a fabulous evening at The Brit Awards at the O2 downing my third class of champagne, I suddenly remembered I’d given up drinking. Well, I’m not perfect. So back filming Escape to the Country (yeah!!) after a few months off. Cambridgeshire, North Devon, Dorset and back to Eat Devon this time with a new couple. Great start to the new series, I’ve so missed it, and praying the sun continues to shine. What a wonderful place to go to work. Jealous of my ‘office view’ every day?!! Not only is Escape such a popular show over here, but also around the world. Oh yes, we’re ‘global’ don’t you know. Move over Top Gear… Always makes me chuckle when Aussies come up to me when I’m filming Wanted Down Under and ask if anyone ever buys the mystery house…? Of course they do!! Filming this year has already seen me name my own crisp flavour, ride in tanks and an SPG (self propelled gun! ), and attempt to climb a cliff face on the Isle of Portland (nervous times). All in the name of being a presenter. Bring it on. 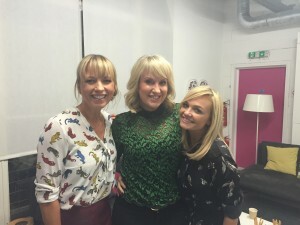 Talking of this show, I met up with a dear friend of mine a few weeks ago, the one and only Miss Emma Bunton. 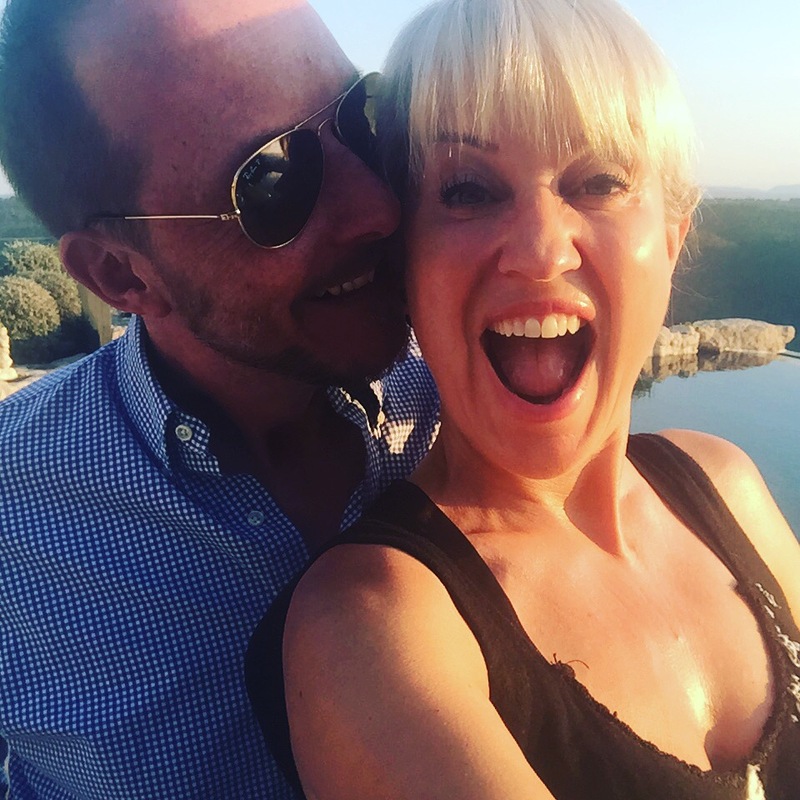 She and the lovely Sara Cox have a new show on BBC2 called ‘Too Much TV’ and invited me on to discuss Escape, Wanted Down Under and my old Pop Idol days. Here we are together. A couple of press pieces I’d love to share with you this time, firstly thrilled to be included in May’s issue of Good Housekeeping Magazine “A Letter To My 16 Year Old Self.” An honest article about how I felt after leaving school at 16 with few exams and no direction in life and how I’ve changed over the years. 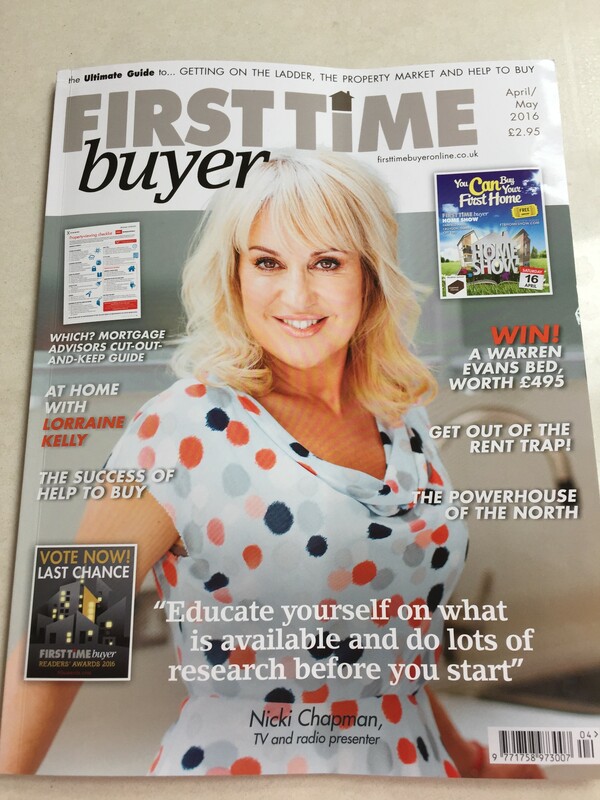 If you get a chance, please have a read… Also I’m gracing the front cover of this quarter’s First Time Buyer Magazine and hosting their event later on this month. 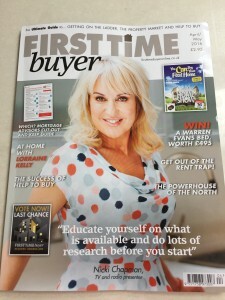 I’m passionate about giving people honest advice and suggestions about how to get on the property ladder for the first time… it can be confusing and depressing time, a daunting thought especially when we look in the estate agents window or read the daily news. I like to think there is light at the end of the tunnel for many people, and hopefully this mag may prove helpful. Special thank you from me to Seb and Edward T Cooke @ WMA for the gorg photos! Back reviewing the papers again soon for Sunrise. Been a regular guest so far this year and really enjoy being part of the news debate. 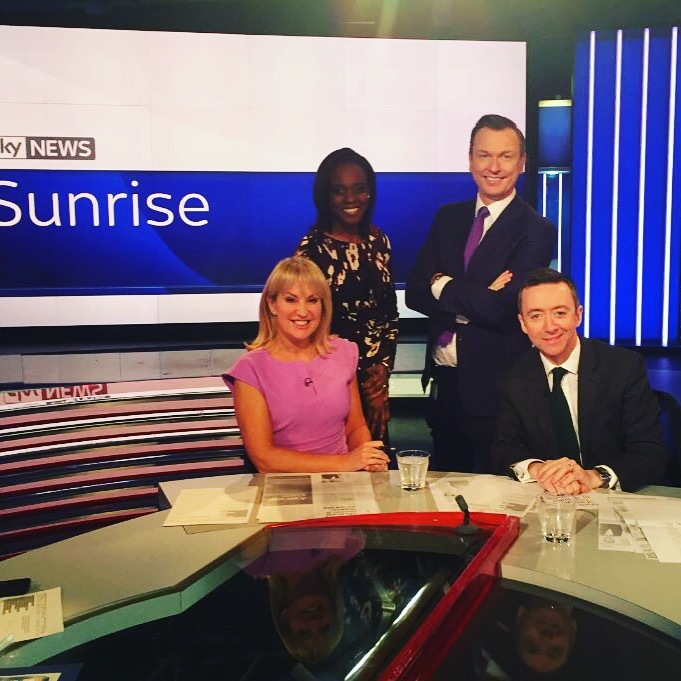 Love this photo on the set of Sky News with the gorgeous pairing of Stephen Dixon and Gillian Joseph with my fellow reviewer Kevin Schofield, Editor of PoliticsHome.com. Kevin and I look like the ‘anchor couple’ but we all know it’s really Stephen and Gillian that are in charge! Since we last spoke, I had a ball on BBC Radio 2 over Christmas and New Year, plus also a week at the end of January sitting in for Vanessa Feltz on Early Breakfast. After 20 years working in the music business (have I mentioned that before…? OK, don’t yawn), playing and hearing great music again does take me back… I won’t dwell too much on my past life but safe to say it was some of the best years of my life and being at R2 takes me back somewhat. Plus it also introduces me to some exciting new music and artists too. On a sad note, we lost one of the greatest artists of all time. A man who they said was ‘often copied but never equalled’: David Bowie. I worked with him in the 90s. What an honour. Any words here would not do justice to what he achieved and gave us over the decades. A true legend and my ‘idol’. January saw me return to BBC Belfast to finishing the voice overs for the new series of Wanted Down Under. This year the series is going out at a slightly later time on BBC1 in the mornings. These amazing families and couples are proving as popular as ever… It’s addictive viewing. Where can I buy those flags? (in joke). 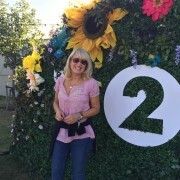 Talking of popular, those BBC2 bods have decided to give you a second helping every day at 7 am… Early I know, but now two portions of yours truly every morning can’t be bad? Perhaps don’t answer that. I’ve been featured in quite a few press articles and interviews recently, that have run throughout December, January and Feb. My favourite piece was the ‘at home’ spread in OK! 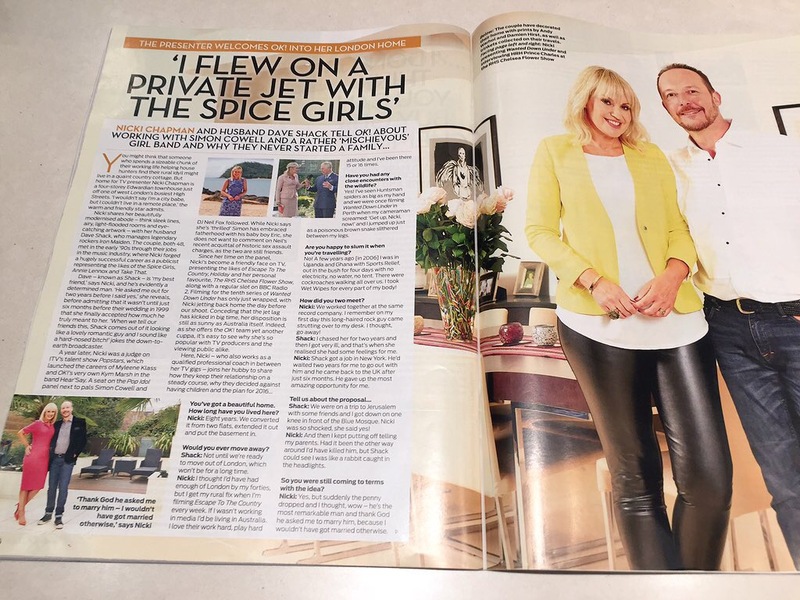 Magazine talking about work, married life, filming commitments, as well as a sneaky peek around Chez Shack/Chapman, private plane rides with the Spice Girls and what makes me tick. Thanks to the OK! team. We donated our fee to The Truants, who have raised nearly £2,000,000 for three amazing charities to date, including Nordoff Robbins (music transforming lives), Teenage Cancer Trust and Childline – charities that are all close to both our hearts. On the morning of the shoot, I’d just arrived back from Australia and woke up at 1am – so cleaned the house from top to bottom (thank you jet lag)! Cleaning aside we had a very special day. Shacky doesn’t normally ‘do’ photo shoots or interviews, but it was a very enjoyable experience and I now have photos that I will cherish forever. Thanks also to the Sunday Telegraph (Fame & Fortune interview), Bella Magazine, The Daily Express, Woman’s Weekly and Daily Mirror. 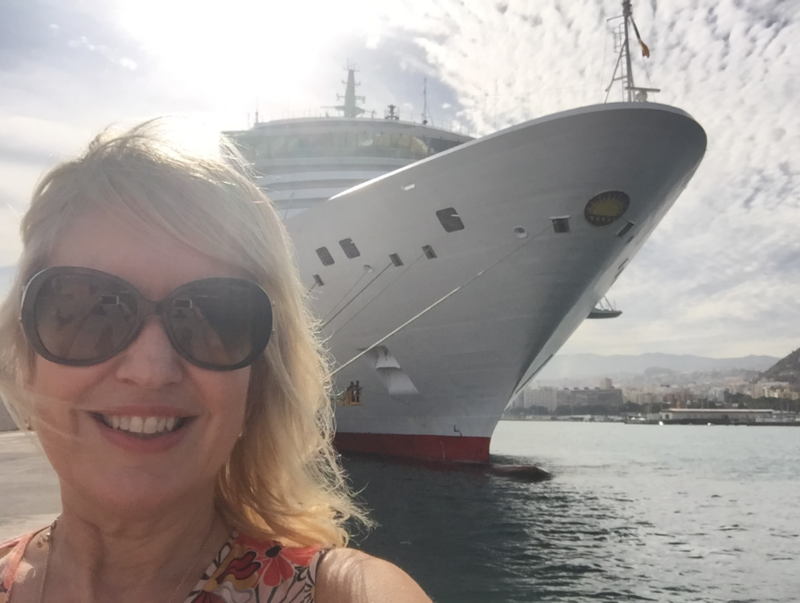 Before my talk at Arcadia, P&O Ferries! I met the NAFAS team in London for a catch up and to talk about the future of this wonderful charity. Floral design with excellence sums it up. My floral efforts are always discussed during the RHS Chelsea Flower Show week, often in less than complimentary tones, but the group are determined to improve my designs. I love their enthusiasm and positivity and am honoured to be their patron. They have branches throughout the UK, so if you’re tempted go online and visit one near you. Everyone at any level welcome, even me! The entertainment team at P&O Ferries kindly invited me back to give some talks on Arcadia, one of their finest ships, during it’s worldwide cruise which started in January. Yes January, the most depressing month of the year. Sadly I was only on one section of this fabulous cruise but hey, a wonderful way to gently ease me into the year. I spoke about my career, past and present. Thanks to all the super passengers who not only turned up in their hundreds to hear me talk (gulp), but also for the brilliant feedback and love for my shows. You always hope people like what you do when you’re a presenter, but it’s not until you get talking to the people that matter that you know for sure. The good news is I’m ‘back in the saddle’ (no comments please) after 5 months waiting for my ankle to heal. Still taking it easy but the gym, rehab exercises and two brilliant physios have made a difference and I’m getting there! With a busy filming schedule starting in March, I’ve got to do all I can to get back to fitness. I’m a little rounder than I would like to be but hey, at least I’ve got a good excuse! So finally, the BAFTA’s are on as I type, and we’ve just found out Best Documentary goes to ‘Amy’…Congratulations to all those involved for this extraordinary film on her life. Amy was just 16 years old when my partner Nick Godwin and I signed her to our management company, Brilliant!. Many things have been written about this woman but my lasting memory of Amy will always be this remarkably creative talent walking through our door looking, no searching, for a record deal. She made such an impression then, as she still does today.